PAPUA New Guinea has lost a true down to earth Knight, Sir Michael Curtain. 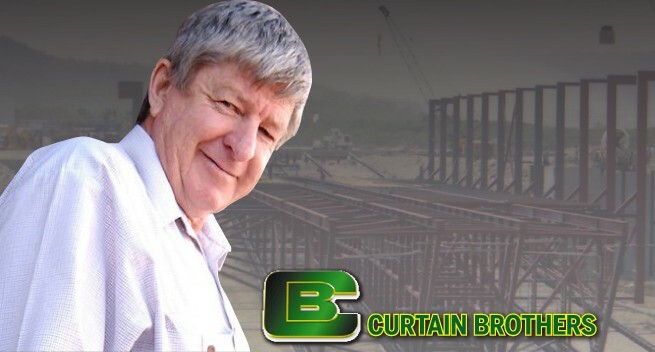 Sir Michael is the owner of civil engineering and construction company Curtain Brothers Limited, who passed away in Townsville on the eve of PNG’s 41st Independence Anniversary. Sports Minister Justin Tkatchenko in confirming the passing of the Knight said, "Today we lost a true champion of PNG and a man that dedicated most of his life and resources to our country. "Late Sir Michael Curtain will be remembered and honored for his commitment to PNG... our love and sympathy goes to his wife, children and family in this very sad time. May his soul rest in ever lasting peace. We will never forget you Sir Michael and thank you for the Memories." Sir Michael was a down-to-earth figure preferring action over words, for example in 2014, he brought his machinery to upgrade the Boera road in Central Province at his own cost, despite opposition from some landowners who wanted compensation over the land. Some of Curtain legacy remains today including the Motukea Port Development, reclaimed land at Port Moresby’s waterfront and the new Sir Hubert Murray Stadium. When officially announcing his death, General Manager of Curtain Bros Papua New Guinea, Justin McGann described the late Sir Michael as a great leader of the Curtain Bros Group and a visionary statesman. The late Sir Michael Curtain, passed away at 3:30pm on Sunday Sept 11, 2016 in a hospital in Townsville. Sir Mick was with family and friends and had his dear wife of more than fifty years by his side. McGann in a statement said, "I spoke with Lady Jennifer Curtain late yesterday and she said that Sir Mick was at peace. "Our prayers and thoughts go out to Lady Jennifer and her children Peter, Louise, David, Christopher, and Sean, they have lost a great husband and father. "We have lost a most wonderful leader and fantastic innovator, someone who was so far ahead of all of us, that at times he seemed to be generations away. "Sir Mick was the greatest promoter of Papua New Guinea’s potential and the capability and capacity of Papua New Guineans. Out of respect for Sir Mick, and in honour of his memory, Curtain Bros will continue to develop the dreams that he initiated to their full potential." Sir Michael started the Curtain Group along with his brothers Dan and David Curtain in the country in October 1966 with the commencement of operations by the company known as Curtain Bros Papua New Guinea Limited. The brothers travelled to PNG for work with the Territory Administration. Not long after arriving in Port Moresby, they realised the potential for business opportunities and established their Curtain Bros business. In the early days, Curtain Bros PNG was solely a civil engineering and construction company, focusing on roads, subdivisions and airstrips. The business today extends into mining, bridge construction, dam construction, shipping, wharf construction, dockyard construction and operation, major infrastructure establishment, property development and building construction.